We specialise in many fabrics, one of our personal favourites is the handloom craft, Banaras brocade, also known as Baranasi! 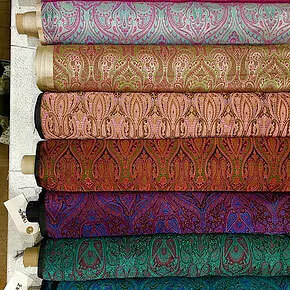 Banaras brocade has an ancient history in the world of textile design, the practice of weaving Silk and Gold is believed to date back to before the Moghul period. Originating in the Banaras region (also known as Varanasi) of India, a city located on the famous ancient Silk Path. It is an expensive textile made from Silk and other embellishments, known for its rich, intricate and curvilinear look. It is most commonly used for Sari’s, furnishings, accessories and offerings to gods and goddesses in Hindu temples. The iconography found in the Banaras brocade represents traditional flowers, animals, geometric motifs and stories of the region. The craft of weaving Banaras Brocade continues to this day and yes, they are still made on handlooms!! The ancient art of weaving has been handed down for many generations. Each piece differs from one another, making each and every roll unique in its syle.